Some of you may recall that every year, my department at work throws a children’s holiday party. Last year the theme was snowmen and I made the Styrofoam snowmen centerpieces. This year the theme was penguins. I had some difficulty trying to think of a cute, relatively inexpensive centerpiece idea. Then, I came across this adorable igloo made out of Vellum paper from Bloesemkids. I thought that this would be cute if I could find some penguins to place outside of the igloo. So I started my search. I went to Target first where I found these cute little penguin ornaments. Score! They were $2 a piece which I thought was a reasonable price. So I picked up 10 of them. I also bought some latex balloons and flame less candles while at Target. My next mission was to find Vellum paper and Mod Podge. I went to AC Moore. I found the Mod Podge easily enough. However the Vellum Paper was no where to be found. 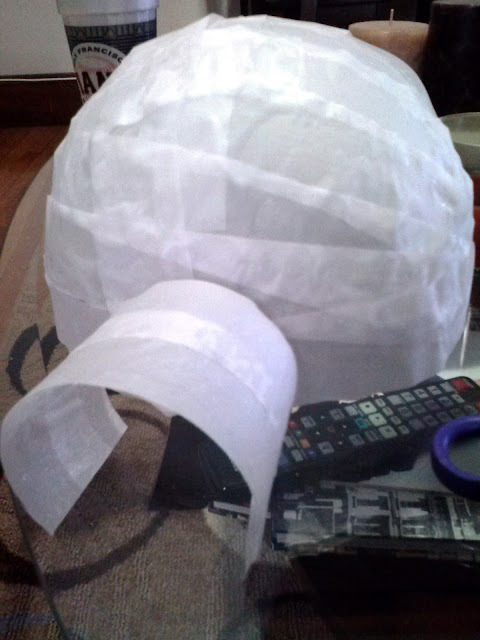 Now, prior to this project, I didn't even know what Vellum Paper was. A nice employee at AC Moore said they had it but it was sold out. I did a quick Google search to see what other stores sell Vellum Paper. And low and behold, Office Depot was one of the first places that popped up. Luckily enough, I was in the same shopping complex as an Office Depot. So off I went and picked up a pack of 50 sheets. Now at this point, I need to apologize for the next set of pictures. I was in a rush to get these done in time for the party and only took a couple photos with my phone. However, Blosesem Kids has some better progress pictures. So be sure to check them out if you are planning to do this project on your own. 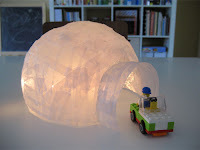 The igloos are fairly easy to make but are a bit time consuming. I started by cutting up the Vellum Paper into strips. I made sure to save a sheet or two for the archways. Next up was blowing up the balloons. 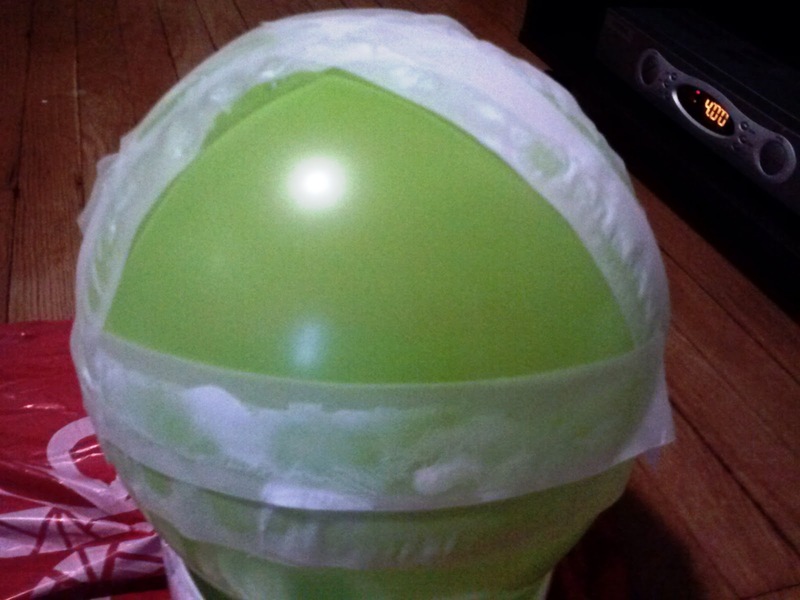 I placed the balloons in bowls (to hold them steady) and started to paste the strips onto the balloons. My first attempt did not go well. I spread way too much Mod Podge onto the Vellum Paper, which caused the paper to crinkle up. To fix that, I watered down the Mod Podge just a tad. 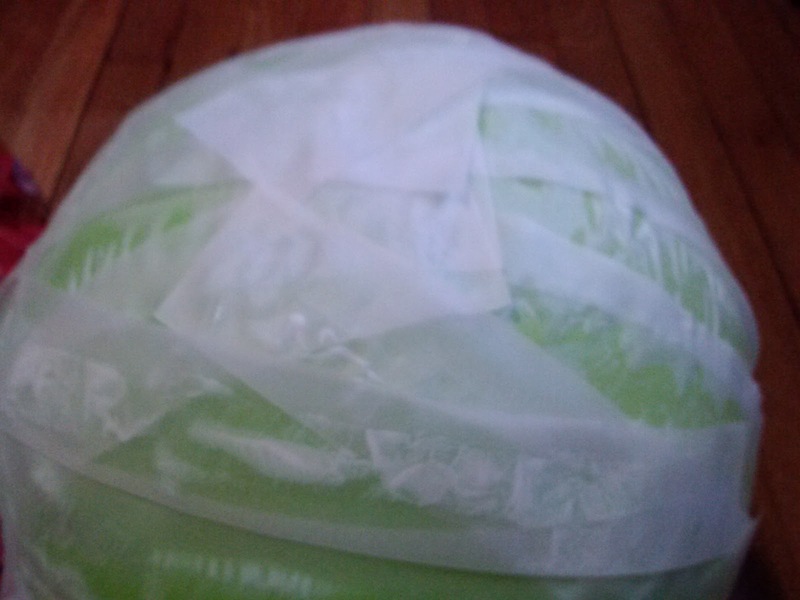 Then using a sponge brush, I spread a very thin layer of the adhesive onto the Vellum Paper and placed it on the balloon. The paper still crinkled a little bit but not too badly. 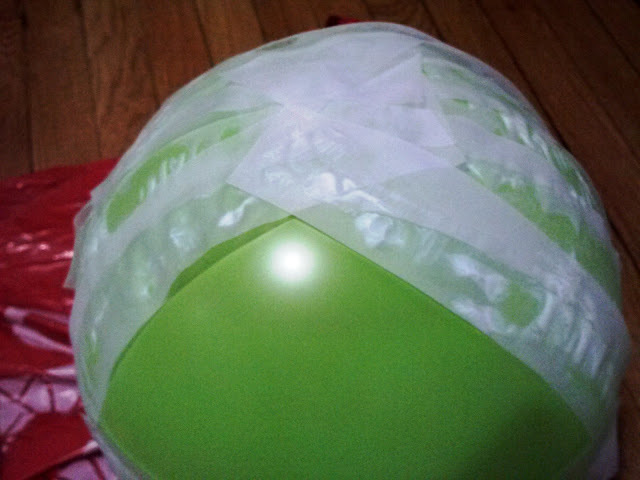 Then I just continued to place the Vellum strips all over the balloon. 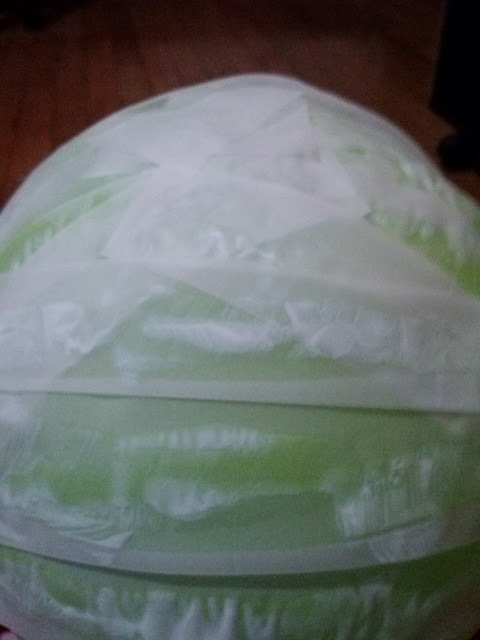 Each balloon took about 30-45 minutes to paper mache and used about 2-3 sheets of paper. Once I finished with the balloons, I covered a few glasses with plastic wrap and mod podged a few strips of paper near the rim. This is for the igloo doors/archways. Unfortunately, I didn't take a picture of this. I let them all dry overnight. In the morning I slowly deflated the balloons. Then, using scissors I cleaned up the edges of the igloos and cut holes for the doors. To finish the project, I broke out my hot glue gun and attached the archways to the igloos. 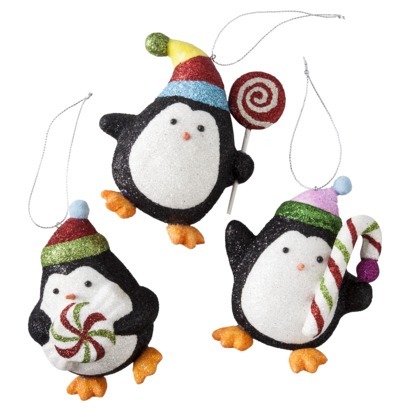 I also attached the penguin ornaments with the hot glue gun to keep them steady. And that’s it! I think they came out cute. I put the flame less candles inside the igloos but unfortunately, the party room was a bit too bright to fully appreciate that detail. The party was a great success! One of our biggest turnouts! I also wanted to share this photo of the party entrance. We had a blow up penguin that welcomed everyone. So I cut out some penguin footprints out of orange construction paper and taped them to the ground leading up to him. Price per centerpiece: $6.95 – not too shabby! Grace and I hope you are all having a wonderful holiday season! I have many posts to type up so keep checking back. We’ll have plenty of new posts in the New Year! nice strategy..would like to try that at home..with other stuffs,,ill keep on checking your blogs..http://extremepaperairplanes.com...i am making few blogs about flying stuffs..try to visit guys..